Much like the return of the Toyota Supra, the reemergence of the Ford Bronco has many people extremely excited. The original Bronco has become highly collectible, so it makes sense for Ford to capitalize on the nostalgia. Ford also needs something to compete with the new Jeep Wrangler, which has basically gone unmatched in its segment since the Toyota FJ Cruiser went out of production several years ago. 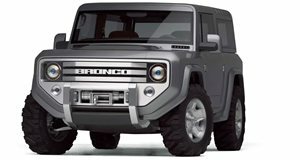 We can't wait to finally see the new Bronco, which was recently shown to a private audience of dealerships in Florida. Based on the few details from the event, we think the Bronco will be a huge success. That being said, we have put together our wish list of features that we believe would make the perfect Bronco. We still don't know what engine will power the new Bronco but it will almost certainly come mated to Ford's 10-speed automatic transmission. There have also been rumors that Ford is working with Getrag to develop a new seven-speed manual called the MT-88, which could be mated to a 2.7-liter twin-turbo EcoBoost V6. The Jeep Wrangler still offers a six-speed manual, so we think Ford would be wise to offer one as well for fear of angering internet commenters if nothing else. One of the original Bronco's most significant features was the ability to remove the roof and doors. Only the Wrangler currently offers such a feature, so Ford could take away some of Jeep's customers if it offers the same ability. According to reports from the dealer meeting, the Bronco will retain its removable doors and roof, both of which can be stored in the cargo area. It will also have pillar-mounted mirrors, so they remain in place when the doors are detached. All of this means the Bronco may be a better open-cabin experience than the Wrangler. Although we expect the four-door Bronco to be the volume seller, we still want to see a two-door version. The original Bronco only had two doors, so this would be a nice nod to nostalgia. The dealers were reportedly shown a two-door Bronco, so it looks like this wishlist item is safe. Whether the Bronco comes as a two-door, four-door, or both, we hope Ford keeps the design as familiar as possible. Much like a Porsche 911 or Land Rover Defender, the Jeep Wrangler hasn't changed much over the years. We have enough curvy crossovers to choose from, so let's keep the Bronco boxy and truck-like. What could possibly be cooler than a Bronco Raptor? For this, we'd like to see Ford include the same 3.5-liter twin-turbo V6 found in the F-150 Raptor producing 450 horsepower. No other automakers have attempted to challenge the Raptor directly, so a capable SUV with the same powertrain would likely go uncontested. What makes the Wrangler truly special is its designated off-road ability. Ford needs to ensure that the Bronco comes with dedicated off-road features such as four-wheel-drive, a body-on-frame design, locking differentials, and chunky tires. Plenty of SUVs use clever electronics but we think the Bronco should do it the old school mechanical way.